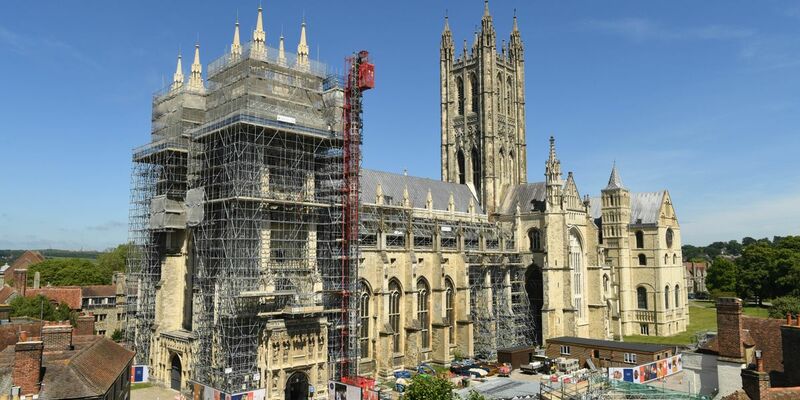 The Canterbury Journey will address the urgent restoration needs of several key areas of the Cathedral to conserve and safeguard this important part of our heritage. The Nave was designed in the late 14th-century and recent inspections tell us that the roof coverings are weakening and there are issues with water drainage. 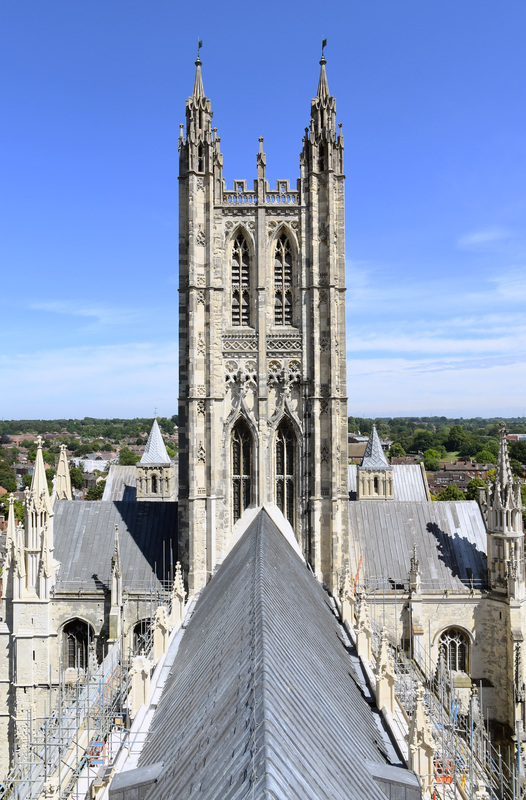 The Cathedral has been carrying out a schedule of running repairs, but important elements of these have now reached the end of their life expectancy and a point has now been reached where the only solution is the complete replacement of these materials. The central part of the Nave roof has been repaired and re-leaded, seen here in June 2018.
an urgent need to conserve and protect them. While these repairs take place, a safety deck has been installed across the ceiling of the Nave to catch any falling debris and enable internal works to take place. 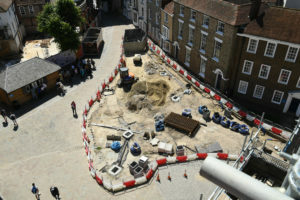 The view of the landscaping is always changing, but here is Phase 1, in June 2018. The Precincts are the terrain through which the visitors pass as they make their journey to the Cathedral, but they are potentially also the place where interpretation and understanding begin. Currently the south west Precincts are fragmented and have no natural flow. The surface is also uncomfortable for those in prams and wheelchairs. The project will focus on enhancing the south west Precincts, improving signage and creating equal access for all, introducing interpretation and bringing coherence to the site. Weather proofing, repair and restoration works to the Nave along with the conservation and protection of the stained glass of the North Clerestory windows, and improvements to drainage, will leave the historic fabric of the Cathedral in a better condition. The landscaping works and enhanced access will provide better interpretation and explanation of the Cathedral’s historic environment whilst bringing harmony and coherence to the site with improved access for all.